Common names: Wildepruim, umGwenya, Mothekele. 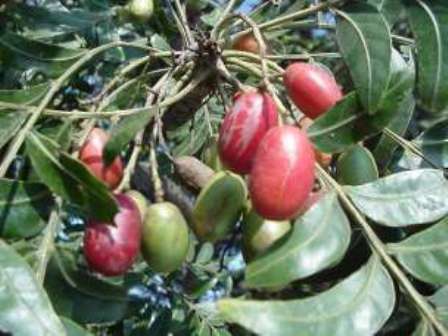 African wild plum is a tree native to Africa. It bears good quality edible fruits which are liked by local people. This tree grows in South Africa, Swaziland, southern Mozambiqueand Zimbabwe Zimbabwe. This is a popular tree in frost-free areas. The wild plum is a large, evergreen tree that grows up to 15 m tall, and is usually found in riverine forests. The main stem is clean and straight, but the forest form often has supporting buttress roots. The bark is smooth when young, becoming rough, dark grey-brown as it grows older. Branches are curved bowed upwards, with leaves crowded towards the ends, forming a thick crown at the top of the tree. 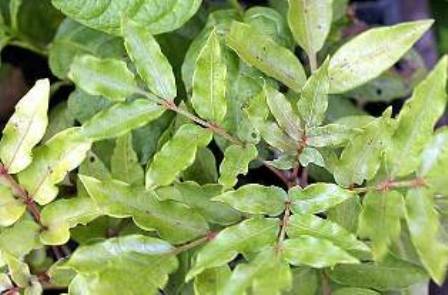 The shiny dark green and glossy leaves are pinnate with sickle-shaped leaflets, and are sometimes interspersed with the odd red leaves. 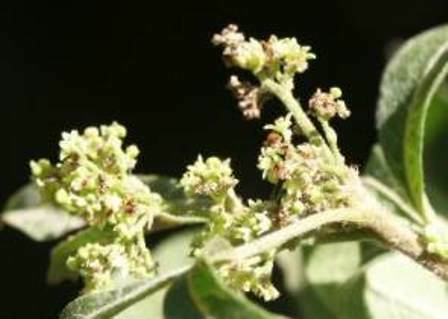 The whitish green flowers are borne near the ends of the branches with male and female flowers on separate trees, throughout summer (November to February). The tasty plum-like fruits first appear green and then turn red when they ripen in autumn; they contain a single seed and are enjoyed by all. The wild plum may be confused with the but is distinguishable by its sickle-shaped leaflets and the leaves that are crowded towards the end of the branches. The fruit of H. caffrum is eaten by humans. They are commonly used for making jams and jellies. With their sour taste, they are also good to make rosé wine. The tree has some potential as a commercial crop, but a preliminary trial planting in the Negev Desert in Israel was reported as disappointing. The bark is a popular traditional medicine. It is used to treat acne and eczema, and is usually applied in the form of facial saunas and skin washes. It is used by people with ‘bad blood’ that results in pimples on the face. Powdered burnt bark is used to treat sprains and bone fractures. Bark is also used for dyeing, and it gives a mauve or pink colour. In some parts of Eastern Cape, root decoctions are traditionally taken for paralysis thought to have been contracted from walking over an area that has been poisoned or polluted through sorcery. The wood of the H. caffrum is pale reddish and fairly heavy. It polishes well but is not very durable. It has been used as a general purpose timber, for furniture and beams. It is also used for carving curios. African wild plum grows easily from seeds. Stored seeds should be soaked in water for a day and then be scrubbed with a brush to remove the fleshy part. It must then be sown in trays filled with river sand or a normal potting soil. They should not be planted too deep as they can easily rot. The seeds take 7 to 11 days to germinate. The wild plum can also be propagated by means of cuttings and truncheons. The truncheons should be dried before planting; they can be left lying in the shade for a day or until all exudate has dried. The hole in which the truncheon is going to be planted should be filled with a layer of river sand to promote root formation and improve drainage. This also helps to combat fungal diseases. 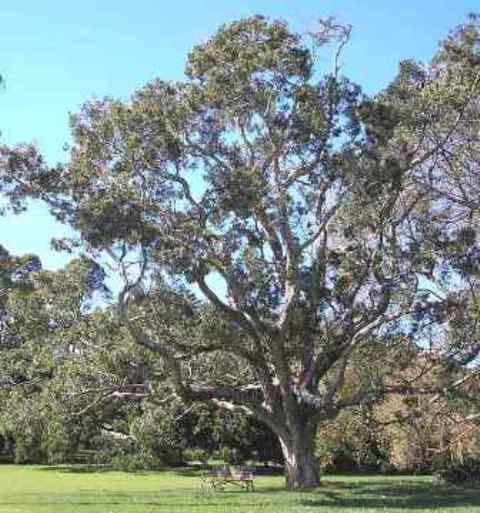 It is popularly planted as a street tree in a number of South African towns and cities. With its thick crown and somewhat drooping leaves, the wild plum is a good shade tree in the garden.